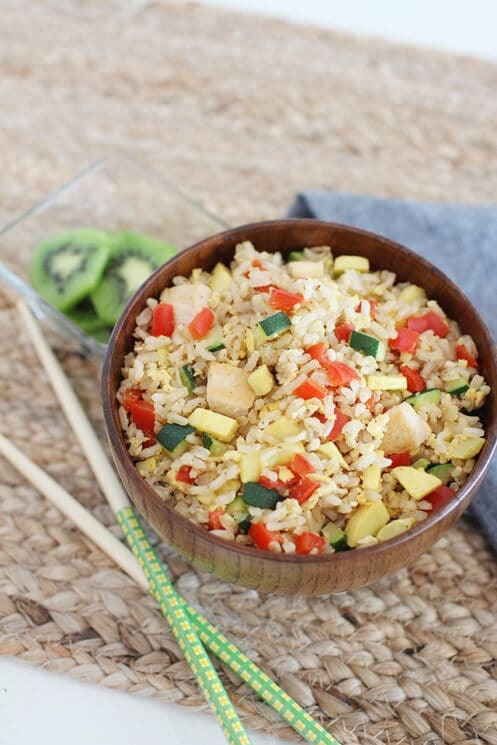 Tasty fried brown rice with chicken, eggs and vegetables makes a slow-release, energy-dense meal or snack for busy kids. Kids spend energy all day long. They play. They concentrate on schoolwork. They do chores. They bounce off the walls. And while it’s easy to think of constant activity as their natural state, we have to remember to keep up with their energy needs by offering balanced, nutrient-dense snacks and meals. This is especially true in today’s world, when the presence of energy-draining foods and habits is so great. You may have noticed your kids not feeling their best when they skip breakfast, eat fast food and candy, or indulge in too much tablet time. Of course, we want to encourage our kids to do and eat the things that DO make them feel great. 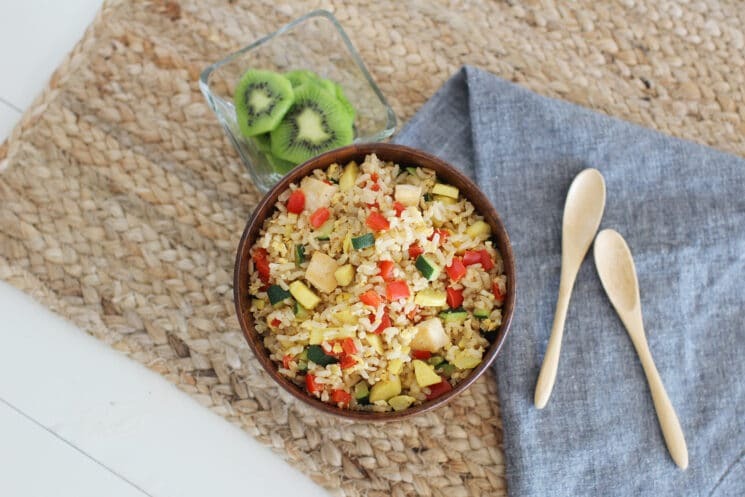 So here’s an easy, fabulous recipe for Fried Rice Energy Bites that helps kids satisfy their big energy needs in a healthy way! 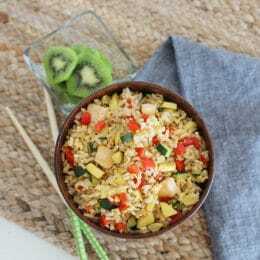 These Energy Bites combine brown rice (a whole grain and complex carbohydrate) with fresh zucchini and bell peppers, eggs, and chicken breast. Why is this a great meal for energy? Pairing complex carbohydrates (whole grains) with protein (eggs and chicken) helps control the release of energy in your kids, so they don’t get sluggish or cranky in between meals. A slow energy release also means that kids feel full for longer. So they can do all the amazing kid stuff that demands their attention throughout the day! Here’s another big plus for busy families: this meal comes together FAST. When parents tell me they don’t have time to cook dinner, I like to share this recipe with them. The ingredients and process are simple even when you’re cooking from scratch. You can also batch-cook and freeze these Energy Bites in ramekins. To serve, defrost and heat the ramekins upside down on a plate, then lift up the ramekin to reveal the dome-shaped rice. My kids love poking into it with a fork to eat. Speaking of kid-preferences, if you have a picky eater who doesn’t love scrambled eggs, do try these Energy Bites! Since the egg is mixed in with other ingredients and flavored with soy sauce, you might have good luck. Keep on trying… it pays off! Do you have a favorite snack or dinner that balances proteins, carbs and fat for long-lasting energy? What do your kids like? All in one instant pot brown rice and chicken. Meanwhile, dice zucchini, summer squash, and bell pepper; mince garlic. Dice chicken into small pieces. Add olive oil to a large skillet and heat over medium. Add diced veggies and garlic; saute until softened, 5-8 minutes. Break eggs into a small bowl and whisk slightly to combine. Pour eggs over vegetables, and move eggs around while they cook. Add the rice, chicken, onion powder, salt and pepper; stir until everything is well combined. Add soy sauce and stir one last time. It’s tablespoon. Instead of a teaspoon. Glad you stopped by! Thanks for commenting. Do you happen to have the nutritional information for this recipe? Thank you! We haven’t analyzed this recipe yet! If I do, I’ll let you know. Or, if you would like to you, you can at nutritiondata.com! I am going to try this today, maybe ill try to add a face for my toddler:) Can you tell I was reading posts from all over the site, lol. We’re glad you were Nataly!! Alot! I’d say total about 6 cups. So, if each person eats 1 cup, 6 servings! I included this in my January Real Food Meal Plan – thanks for posting! To make this “fast” do you precook and freeze brown rice? 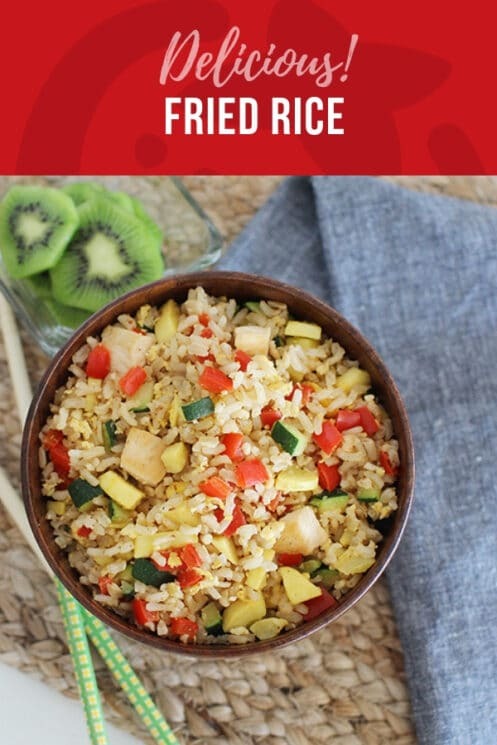 When I see “cook brown rice” I think of about 35 minutes of water boiling and rice cooking and fast for me means 15 mins or I start my walk to the pizza place! ( I know, I’m still learning!) Will it be sticky if I add extra water and freeze the brown rice to have it ready for putting together? If I do this, can I refreeze into the portions as you note (I really like this idea, by the way!)? Thank you, as always, in my 3 years of adding more of your great recipes into my family’s “favorites”! yes Lisa- we’ll do this with leftover rice all the time. You could also get minute rice, it also comes in brown! Yes, I learned the hard way tonight, the brown rice needs to be cooked first! oh no! So sorry- We had to migrate our recipes, and some ‘critical’ elements got lost in translation! I’ve fixed it. Thanks Kami! Any suggestions to make these egg free. My little guy is allergic. ohh rice recipe yummy !! !